Christmas Candles: Worked on 14-count green perforated paper, the golden candle flames sparkle within a tartan border. The card stands about 10 cms high. Christmas Candles is also available on its own in our small Christmas cards range. Christmas Holly: An explosion of Christmas flowers and greenery, this design is worked on gold perforated paper, and stands about 11.5 cms high. 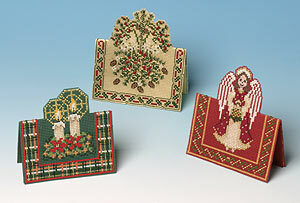 Christmas Angel: This little Christmas Angel carries a small basket of flowers, and stands about 11.5cms high. She is worked on 14-count red perforated paper and sparkles with gold thread.